Doing some dinghy mast repairs and am learning as I go. I have two clam cleats to attach to the mast. The small clam cleat is proving a bit more of a tricky proposition as the nose of the pop rivet gun will not reach into the cleat to allow me to rivet the cleat to the mast! To overcome this I was advised my the friendly team at SuperSpars.com who manufactured the mast to use small nuts or washers on the rivet mandrel for the standard nozzle to pull against. This will work for the lower attachment location but not for the other where I will have to use a stainless steel self tapping screw. 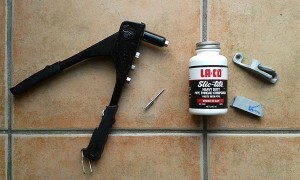 I found some nice Clam Cleat Attachment Tips on attaching cleats on the ClamCleat.com website. This entry was posted in Sailing and tagged Calmcleats, Masts, Monel Rivets, Sailing, Stainless Steel Self Tapping Screws, Topper Sport 14 on March 28, 2014 by admin.